Saving at JBF is as easy as 1...2...3! Check the Schedule to find the shopping time that's best for you. JBF is open to the public and FREE passes are available online. Saving money at JBF is too good to miss! 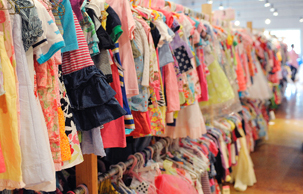 Get the best in new/gently used items for newborn through young teens, 50%-90% off retail! You'll feel SMART, your children will look GREAT, and your wallet will be HAPPY! Cash, Visa®, Mastercard®, Discover®, & AmExTM accepted with picture ID. Sign up online to stay updated about our future #JBF817 semiannual sales. - Children and strollers are always welcomed at our public shopping times. Under 18 are always FREE! - Don't miss out on our FREE PARKING GIVEAWAYS on our Public Shopping Days! Multiple chances to win each day! CLICK HERE for a parking map. Follow the Get Tickets link above for a discount coupon available through 2/27/19. NEW MERCHANDISE arrived last night! Follow the Get Tickets link above for a discount coupon that will give you FREE ENTRY for today! The Fort Worth Family Fest (held only on 3/2/19 from 9 am to 3 pm) includes great vendors and character appearances throughout the day. Enjoy shopping and entertainment for the kiddos! Many items are 50% off the price on the tag today! See Consignor Details webpage for more info. See Early Shopping webpage for more info. - Know the sizes you need before you come shopping. - Check items carefully before you purchase them. - Let a volunteer in the Testing Area help you unpackage an item so you can make sure it is exactly what you are looking for. West of downtown Fort Worth and north of the new Dickies Arena, the Exhibit Hall is in the center of the Will Rogers Center, behind the 20-story Tower, facing the Museum of Science and History. - Ongoing construction in the area may include road closures and impact parking. - Carpool/share parking costs. Have someone drop you off to avoid parking fees. On weekends, free parking lots are nearby off of Will Rogers property. The Western Heritage Garage (west of the Exhibit Hall) usually charges based on how long you are there and may save you money. CLICK HERE for a map to the Will Rogers property, including WAYS TO SAVE MONEY parking at JBF! Don't miss out on our FREE PARKING giveaways each day we are open to the public. Multiple chances to win each day! Don't miss out on JBF! Sign up for our emails so you will stay in the loop about our upcoming sales and community events. Easy to prepare items for sale. Easy to volunteer. Picking up unsold items is easy as well. I participated in the JBF event in Fort Worth and found it to be very satisfying. JBF made tagging and dropping off so easy. I was blessed to have the advantage of a mentor which made the process go smoother. A wonderful event! Ready to MAKE MONEY? You can SELL with JBF too!